I like how the scale goes to an optimistic 60,000 words. Prudence: Well, that’s not looking good. Lot of white space on that graph. Me: Hey, I sent Free Souls off to the copyeditor! At least I accomplished that on time. Where’s Fear anyway? I want to gloat. Prudence: You locked him in the basement with your Internal Editor, remember? Subconscious: Hot boys! In the basement! Ambition: We can totally do this! We still have five days! Me: And with Free Souls done, I can concentrate on steampunkery fun for the whole week! Inner Spock: My calculations show that’s nearly 6,000 words per day for the next five days. Ambition: We’ve done 10k in a single day before! Me: Yeah, but I’ve finally found my voice with this story, and we’re just getting to the good parts: kissing, political intrigue, double and triple betrayals, and steampunk dirigibles. Me: Besides, I’d really like to get a full draft of this story done before I let it sit for a while to concentrate on other things. Prudence: Aren’t you forgetting you need to do a Mindjack trailer reveal? Oh, and maybe launch that Free Souls book you finished? And there’s Christmas… your children would probably like some presents this year. Me: Have they been good? Prudence: That’s not the point. Me: Seems like that should be the point. Wasn’t there a song about that…? Prudence: *taps foot, folds arms* You’ll have to have maniacal focus to get this done. Me: I’m a steely-eyed writing machine, when I need to be. Prudence: Where is Fear when I need him? So… I may be sequestered in the writing cave this week. Or I may be back with Mindjack Trailer news. Or possibly Fear will break out of the basement and strangle me for even trying to finish this book. It's a nice feeling get some of the publishing aspects taken care of to focus on writing! Have fun! Fear is a boy. I knew it!! This is why I don't NaNo. I'm lucky to finish 100,000 word in a year, so half that in a month isn't too likely. Not with this day job. I was doing well until the Thanksgiving break, now I'm behind. I'm at 38k, which is pretty great in my eyes. But I "wasted" time yesterday going back to previous chapters to add more detail and change some things that affect the end of the book. 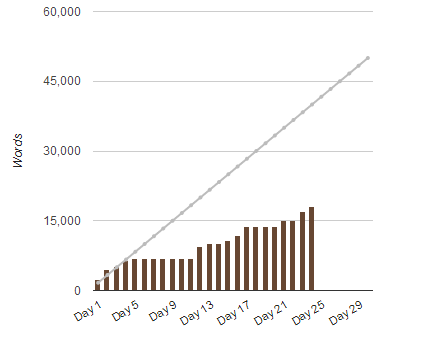 I know that's a Nano violation but I consider it a win that I've made it to 38k with a fairly cohesive story. I don't want to rush into the ending and have it be a mess. For me finishing is a big deal just because I said I would. I am thrilled Free Souls is on its way. Is Blind Optimism back from vacation yet? Ha! Blind Optimism is the love child of Me and Ambition. We keep her sequestered until we need to do something really brave, like push the "publish" button. I'm shocked Despair didn't show up yet. She must be stuck in residual holiday traffic, in a location where she has no cell coverage. And yes, I'm quite sure Despair is a girl. Yes, I'm sure Despair is a girl! LOL She's Fear's cousin, so she's probably out with a search party and pitchforks, looking for him. Like you said, 'Free Souls' is out to editing. That's accomplishment enough! Ack! I'm afraid that mine is looking a little "whiteish" as well. I was off to a big bang, but the last few days I've been swamped with correcting student exams. I hope these next few days get back to the flow, as I'm getting caught up with all of those papers. LOL! You can do it!! Shutting that damn internal editor is very hard. I wouldn't have finished if I hadn't shut it up. Even so, there's some double story telling because at some points IE just wouldn't shut up unless I fixed something. Now, I need to find a fencing expert, atomic bomb expert, look up some legends and mythical beings, read the stories about King Arthur and Merlin again, and travel to Virginia. I can see why it takes so long to write a novel! Good Luck! I know you can do it!! !